Can dogs eat cashews or are they as dangerous as other nuts to dogs? Cashews can be given to dogs as an occasional treat, although we do not recommend it! Once your dog gets used to the taste, it gets tougher for you to say “No” and if at all, they should be given in extreme moderation. If your dog has been diagnosed with certain health problems, such as pancreatitis, you should never offer even a few pieces of cashew nuts, because the high fat content can further worsen the problem. Cashews are not poisonous to dogs, and they can be a good source of fiber and nutrients, such as omega-3 fatty acids, antioxidants, minerals, and vitamins. They also have a lower fat content compared to other nuts like walnuts, almonds, and pecans. So, if you do want to give some cashews to your pooch, go for the unsalted low-sodium ones. On the other hand, cashews contain high levels of sodium, phosphorus, and calories. Regular consumption of cashews by dogs can pave the way for weight gain and possibly obesity. And obese dogs are more predisposed to developing pancreatitis. The high phosphorus content of cashews can also increase a dog’s risk to the formation of bladder stones. It is also worthwhile to mention that some dogs are allergic to cashews. If you really want to give some cashew nuts to your dog, make sure it’s cooked or roasted; raw nuts contain a toxic substance that is eliminated with high temperature. Like other types of nuts, cashews can be hard to digest. Considering that 1 oz. (about 20 pieces) of cashew nuts already contains 157 calories, 12 g of total fat, and 3.4 mg of sodium, moderation is always recommended. If possible, offer only unsalted or reduced-salt cashew nuts to limit your pet sodium intake. The high caloric content of cashews is directly related to the nut’s high-fat content. Giving your dog a handful of cashew nuts every now and then can increase your pet’s risk of developing pancreatitis, obesity, and bladder stones. Severe cases often involve salt poisoning and even anaphylactic shock (an acute allergic response), which can be fatal! While some nuts can be given in extreme moderation to dogs, there are those that are very toxic to dogs and should never be given. Mild cases of allergic reactions can be addressed by giving your dog Benadryl, a common antihistamine. 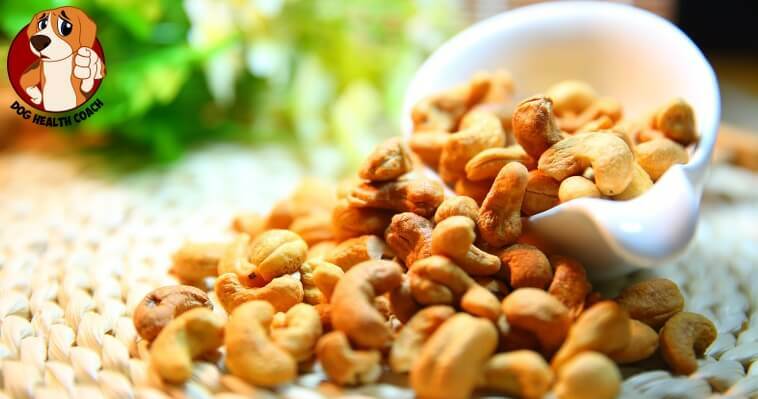 Severe allergic reactions that are manifested after consumption of cashew or other allergy triggers should be brought to the attention of your veterinarian. Did we miss anything? Please share in the comments.